Mac users, rejoice -- well, the BlackBerry users in the lot of you, anyway. RIM's been infamous over the years for all but ignoring Mac support for its devices, throwing out the occasional bone like Media Sync, but they're now going big with a full-fledged Desktop Manager supporting Mac OS 10.5.5 and above when it launches... sometime. The big sticking point right now is that RIM isn't talking about an availability date, all we know is that it'll happen some time in September -- but when that date comes, you'll have a suite that's able to sync iTunes, add and remove apps, perform firmware updates, create backups and restore from them, and manage multiple BlackBerrys at the same time. Nokia, maybe you guys want to take note here? 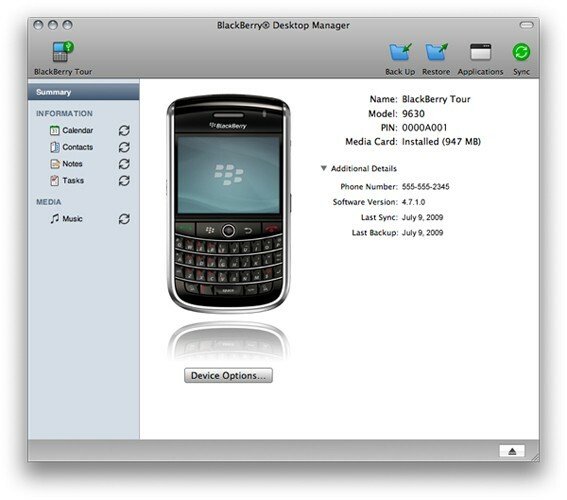 BlackBerry Desktop Manager coming to Mac in September originally appeared on Engadget Mobile on Mon, 20 Jul 2009 14:07:00 EST. Please see our terms for use of feeds.